I finished the afghan I’m giving my mom for Christmas. It’s pretty huge. 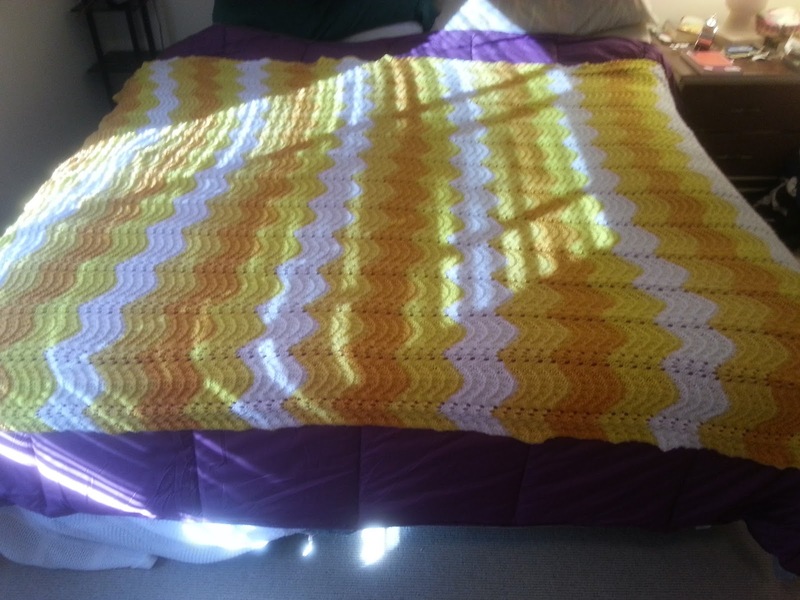 Which was deliberate — I wanted it to work as a throw on her bed, and not just a lap-blanket sort of thing — but still, I was kind of O_O when I spread it across our king size bed to take pics. This is looking up from the foot of the bed. 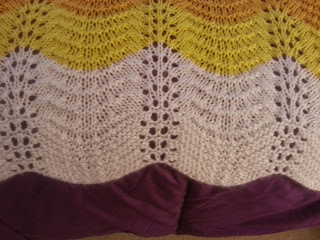 A closeup showing the pattern. 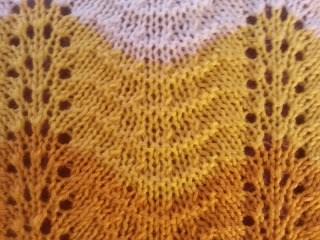 It’s a basic feather-and-fan that I worked out on a paper towel, fiddling and swatching and fiddling and swatching till I had something I liked. 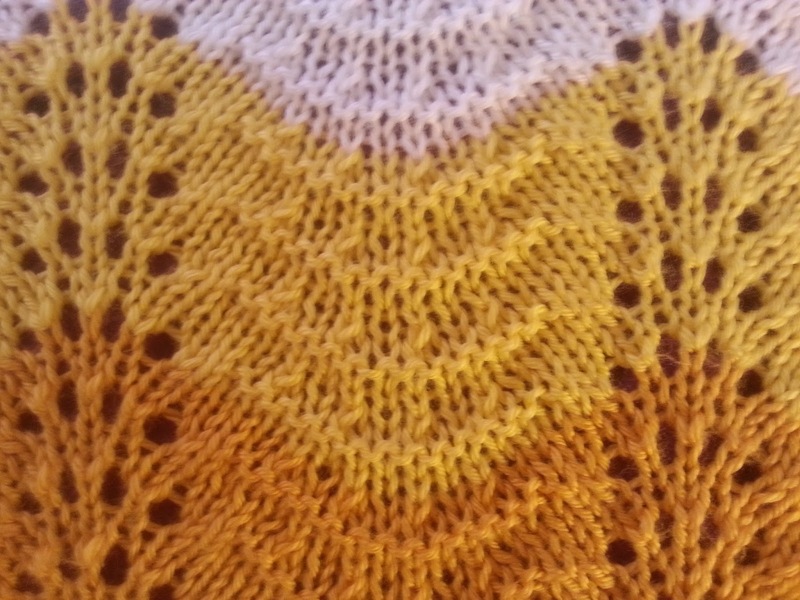 One thing I noticed is that if you do a F&F pattern with a stockinette ground, which is how you usually see it, the rippled edges will curl up, which looks like a mistake. 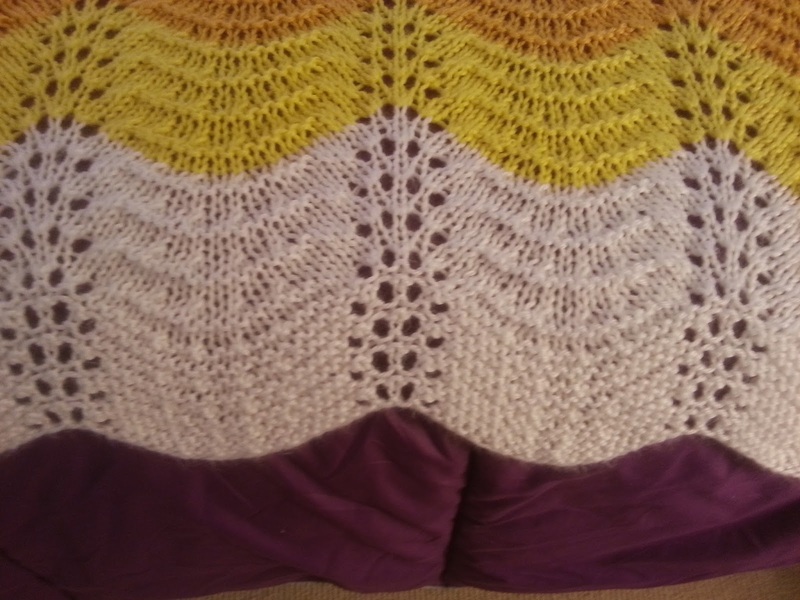 :/ I experimented a bit and found that if you knit that edge with a garter stitch ground, it lays flat, so the first few inches and last few inches of the afghan are in garter stitch, which you can see more clearly below. The texture is a bit odd, but I’ll take that in exchange for an edge that lays nicely flat. This is a fun video, with lots of great info and some laughs. Thanks to Lee Wind for the link! Yesterday was my birthday — I turned fifty-one. Which makes today the first day of my second half-century. It sounds pretty neat, actually. I’ve never had any age hang-ups, and thoroughly agree with this cartoon by The Oatmeal, but being fifty-one feels unusually cool. The Start Of My Second Half-Century sounds like a beginning, and it’s a beginning to something pretty darned big. There’s an excitement in that, like I’m starting a new slate and I can write whatever I want on it. The past is even more past than usual, and this is the first step into the future, like I’ve come to a whole, huge beach of fresh sand to leave footprints on. That’s what it feels like, anyway, and I’m looking forward to the next chunk of my life. Jim and I are in Santa Clara at BayCon. They started giving the different iterations of the convention subtitles a while back, and this one is “Triskaidecaphobicon,” which made me snicker. The best part is seeing people I’ve known for a long time, many of whom I never or hardly ever see anywhere else. That’s really what it’s all about — keeping up with the people. Sometimes a person from Back When will vanish for years or decades, then pop up again, and that’s always pretty awesome. Lois McMaster Bujold is the writer GOH, which is pretty exciting. I’ve seen her at other conventions; she’s a nice person, and gives great reading.